The most important consequence of the 2014 elections is the increase in votes for both the AK Party and BDP. This may raise hopes for the continuation of the reconciliation process. It was obvious to almost everyone keeping an eye on Turkish politics that the 2014 local elections would be a referendum on the legitimacy of the ruling AK Party following anti-government protests in the summer of 2013, the corruption indictment against the AK Party in the last month of 2013 and the leak of numerous private phone calls and conversations among figures close to the AK Party. The anti-government campaign which utilized wiretapped conversations also targeted the AK Party’s policy for a solution to the decadeslong Kurdish question in Turkey. For example, a leaked conversation aimed to increase suspicion among Kurds that the Turkish state was involved in the killing of three Kurdish activists in Paris at the beginning of 2013. More importantly, leaked recordings of PKK imprisoned leader Abdullah Öcalan’s conversations with other prisoners aimed to imply that the AK Party government had reached an agreement with Öcalan on certain matters such as regional autonomy. Surely, the leaked recordings targeted the legitimacy of the reconciliation process which began between the government and Öcalan in late 2012. The Peace and Democratic Party (BDP) and some Kurdish organizations close to the PKK said during their campaigns that the 2014 local elections would be a referendum on regional autonomy for the Kurdish-majority region in Turkey. For example, the Kurdish Communities Union (KCK) stressed that local elections would be the most important stage of the autonomy project. Similarly, Gülten Kışanak, the BDP’s mayoral candidate for Diyarbakır, said, “If we emerge stronger, we don’t have to wait for the government to have our share of power.” The call of pro-Kurdish actors for regional autonomy and the leaked records of Öcalan popularized the question “Did Erdoğan promise Kurdish autonomy?” as part of the reconciliation process. 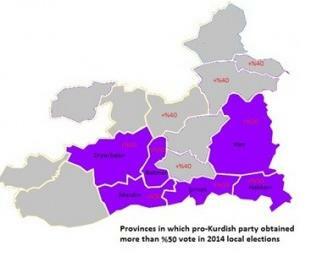 After the elections, pro-Kurdish dailies interpreted the election results as an approval of regional autonomy by Kurds. Is this the case? What do the 2014 local elections say about this interpretation and the future of the reconciliation process? Before answering these questions, the first point to remember is the fact that local elections took place in a relatively peaceful climate thanks to the reconciliation process. When we look at Kurdish-majority provinces (Adıyaman, Ağrı, Batman, Bingöl, Bitlis, Diyarbakır, Hakkari, Iğdır, Kars, Mardin, Muş, Siirt, Şırnak, Tunceli, Hakkari, and Van) a number of important conclusions seem plausible. First, the Kurdish-majority region is dominated by two parties (the BDP and AK Party) as in the last two previous elections. Second, the BDP increased the number of cities where it won the elections from eight to 11, taking the provinces of Mardin, Bitlis and Ağrı from the AK Party. Third, compared with the 2009 local elections, it is easy to realize that both parties increased their votes considerably. Fourth, the AK Party’s votes decreased remarkably when compared with the 2011 general elections. Last, the 2014 local elections proved that the electoral trajectory of both the AK Party and Kurdish parties is not stable. In other words, the electoral trajectory of both sides is marked by ups and downs. The main success of the BDP is, of course, the takeover of the religiously conservative provinces from the AK Party. For example, the BDP increased its votes in Bitlis from 27 percent in 2009 local elections to 38 percent in 2014. In Ağrı and Mardin, however, the BDP took municipalities from the AK Party although pro-Kurdish votes did not drastically change. When results from 2014 are compared with previous local elections in 2009, the BDP increased its share of the vote in 10 cities while its votes decreased in six, including Diyarbakır, the most populated Kurdish city in the region. Importantly, in three cities (Iğdır, Bitlis, and Şırnak) the BDP increased its share of the vote by more than 10 percent and more than 5 percent in five other cities (Ağrı, Muş, Tunceli, Urfa, and Mardin). However, when BDP’s 2014 votes are compared with those in the 2011 elections, changes are not so remarkable. Kurdish-majority provinces in which the BDP won more than 50 percent of the popular votes number six, including Hakkari, Van, Şırnak, Batman, Mardin and Diyarbakır. However, pro-Kurdish parties’ vote shares in these cities were already more than 50 percent in two previous elections with the exception of Mardin (44 in the 2009 local elections). On the other hand, the BDP decreased its votes in both Diyarbakır and Hakkari considerably. In four cities (Siirt, Muş, Ağrı, and Iğdır) the BDP took more than 40 percent of the popular vote by increasing its share in a relatively high ratio. Compared with the 2011 elections, the increase is minor, except in Iğdır. These patterns of change show that the pro-Kurdish block is not in a strong enough position compared to 2011 to claim that the Kurdish people approved regional autonomy. Added to this, while it is certain that the general trend of the Kurdish votes is rising considerably, this rise can be also read as an approval of the BDP’s positive role in the reconciliation process led by the AK Party government. The AK Party increased its votes in the region too in comparison with the 2009 local elections. However, votes for the AK Party decreased compared to 2011. When compared to the 2009 local elections, the AK Party increased its vote in 11 provinces. Of them, Muş, Bitlis, Bingöl, and Urfa witnessed an increase of more than 10 percent in the AK Party’s votes. In other cities except Tunceli, the decrease in AK Party’s votes is minor. Only in Tunceli and Iğdır, were the AK Party’s votes below 20 percent. However, this inferior percentage is unrelated with Kurdish consciousness in these cities. In cities where the BDP took more than 50 percent of the vote, except Şırnak and Hakkari, the AK Party received nearly more than 35 percent. 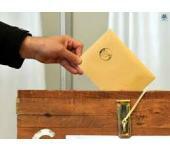 There are three possible explanations for the increase in the AK Party’s share of the vote. First, the Kurdish people voted for the reconciliation process. Second, small parties lost their voters to the AK Party. Third, turning the local elections into a referendum for the AK Party has an effect on Kurdish voters. Whatever the reason, it is clear that the AK Party continued its competitive power in provinces in which BDP gained less than 50 percent of the vote. The 2014 elections also showed that Kurdish votes continue to be flexible while the BDP’s unrivalled status is certain in Diyarbakır, Şırnak and Hakkari provinces and it is clear that in Kurdish-majority provinces support for Kurdish parties is gradually rising. More importantly, the AK Party proved that it is able to increase or secure its vote in the region. However, in my opinion, the most important consequence of the 2014 elections is the increase of both parties’ votes. This may raise hopes for the continuation of the reconciliation process. For example, pro-Kurdish parties’ sense of failure in the 2007 general elections in which votes for Kurdish parties decreased from 6.2 percent in the 2002 elections to 3.8 percent resulted in the rise of PKK activities. Though, it should be kept in mind that the PKK is not disarmed yet and its members are in northern Iraq, which makes the reconciliation process brittle.